I received some helpful feedback from fellow students and my tutor following my first attempts at video presentation of work (5-Feb-2016). One question regarded use of video for assessment, and my tutor has confirmed they should be useful as long as they are embedded in my blog. The narrated and more dynamic version was preferred by everyone who responded. I’ve now organised a less textured background (ie not unironed sheets! ), although in the end stayed with white as I need all the light I can get during filming. Most of the new video is shot very close to the object which could be an issue, but I’ve tried to pick it up and move it around to give an idea of its physical characteristics. There are also a couple of photos inserted, which may add some interest. I think the biggest downside of the new version is that it’s longer. Sample p5-8 was first presented 14-Feb-2016. I didn’t feel my text or photographs really showed what I was seeing in the work. I hope this video is more effective – any more feedback or suggestions very welcome. Edit 28-Feb-2016: Inger suggested a closeup picture of the thread ends. Updating the video would be tricky, instead below is a detail showing both threads and some of the blue fuzz on the general surface. Presentation of work for assessment is a challenge for distance learners. Virtually all the OCA students face it, but Mixed Media for Textiles includes challenges of fragile / over-sized / heavy / temporary samples. Postage from Australia is another issue, then with my “collection of vessels: an exploration of materials and space” I’ve made it still harder. How can I present the physical evidence of that? At least part of my submission must be actual work mailed and able to be picked up and examined by the assessors, but I will need to augment that with material in my blog. So while sampling vessels I’m also sampling how to present them in space. This first attempt is a presentation of sample p5-4, initially discussed 31-Jan-2016. First a simple video showing a rotating view of the sample. No voice because I was trying to keep it short and the focus on the vessel – but I suspect it’s deadly boring. Next my discussion of the sample, trying to point out what intrigues me about it. 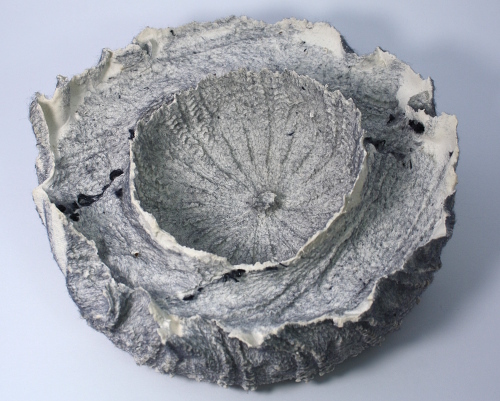 This is heavily influenced by Ceramic Points of View: ‘Cup on Base’, by Gillian Lowndes on the Victoria and Albert Museum website http://www.vam.ac.uk/content/articles/c/ceramics-points-of-view-gillian-lowndes-cup-on-base/. 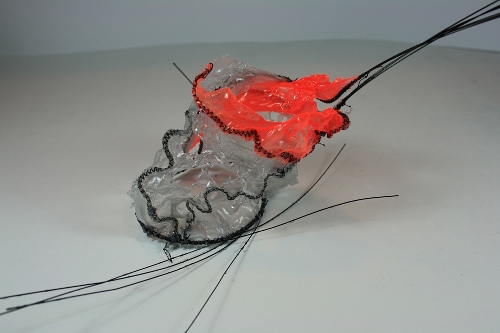 In particular Alison Britton picks up and move the work as she discusses it, and it really helped me to see her point of view and the mass and dimensionality of the piece. I would really appreciate any feedback on the usefulness or otherwise of these, so any comments or suggestions are particularly welcome. In my discussion I mention sketching the sample. I haven’t posted those pages yet, so a preview is below.